Chicken hatcheries helped Tyson Foods become a grocery cart staple. Technical innovations keep it one. The path to disruption is paved with emerging technologies and abundant use of the experimentation process. Sometimes experimentation requires digging into a new technology to uncover an unconventional use. Tyson Foods is tailoring that process to create in-house solutions. Management charged its emerging technology team with finding technologies that could be applied internally. The team had to uncover "parallel innovations" that could be applied specifically to Tyson's operations, said Chad Wahlquist, director of emerging technology at Tyson Foods, in an interview with CIO Dive. The whole idea of the team is to "find new technology in the marketplace," he said, "not just new [technology] to Tyson Foods." Incorporating technology into all aspects of business is a familiar step for companies like Tyson. Born during the Great Depression, Tyson Foods faces the same obstacles as other incumbent companies with legacy reputations, like Unilever and P&G. To their advantage, incumbent companies own about 80% of the world's commercialized data. Incumbents need to say, "what got us here isn't going to get us where we want to be," according to Wahlquist. And they have to learn from digital giants like Facebook and Google how to allocate capital. Redirection isn't because these companies did anything wrong; technology and business strategy was designed differently back then. "Tyson might be an incumbent company," said Wahlquist, but "that means there's just a breadth of opportunity for digital transformation." At Tyson, no emerging or disruptive technology is off limits — artificial intelligence, blockchain, autonomous robotics and drones are all under consideration. Finding the technologies' unique application to the food industry is what Wahlquist and his team are tasked with. What sets incumbents apart today is the ability and willingness to depart from their old strategy and adopt something new. Communicating this transition helps build the bridge between a tech team and nontechnical leadership. For Tyson, it was saying "hey, this chicken plant was built in 1960, when we sold whole chickens," said Wahlquist. "Now we got 380 SKUs of fresh poultry, that changes the game of how things work." 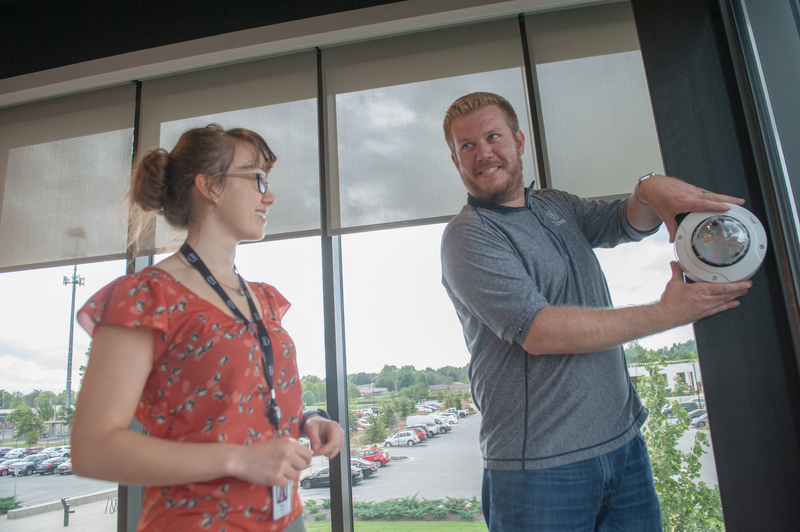 The emerging tech team marries its work to Tyson Foods' mission: making quality, safe and affordable food for consumers and focuses on how the company reacts to consumer preferences and improves product creation. Tyson is in the midst of building pilots and tools internally. The team has "proved the concepts already," according to Wahlquist, so now scalability testing and finding ways to make it work are the next steps. There are multiple projects underway. The emerging tech team is currently building a computer vision system for identifying and tracking in its plants, Thea Ross, senior developer of applications at Tyson Foods, told CIO Dive. Ross has also finished a project to improve sustainability, which was prompted by the company's work to reduce water consumption 12% by 2020. Tyson wanted to get water data in near real-time into its local databases from about 100 dispersed plants across the U.S.
She used internet of things devices in each plant to "ingest our inflow of water in each of our plants" to measure what water was going where, how much water is going to the chiller and how much water was being used to make Tyson products, she said. The emerging tech team relies on agile and DevOps to "feed off each other," said Ross. Agile has empowered the team's ability to work together where DevOps allow it to understand it can integrate original code into existing systems. The cornerstone for agile is learning. It's important for the team to "have time to absorb that learning and adjust course if needed without the fear of executives coming and beating us up about dates," said Wahlquist. It's not that dates don't matter. But Tyson's leadership has given Wahlquist and his team the liberty of time and experimentation to ensure what they're doing is right. However, even with supportive leadership, Tyson's tech team has seen some organizational hesitation, particularly to the cloud. Migrating to the cloud receives the most organizational resistance because people are having a hard time coping with the idea that the code they own lives in someone else's data center, according to Wahlquist. While Tyson still operates some of its own data centers, Wahlquist knows this isn't a long term solution for Tyson or any company. "If I was starting from scratch today, I wouldn't go build a data center, would I," he said. Asking this simple question starts to ease the resistance of nontechnical employees.